Jakarta, September 15, 2018 - Sinar Mas Land, through its subsidiary PT. Puradelta Lestari Tbk (PDL) together with PT. Panasonic Homes Gobel Indonesia (PHGI), unveiled their new SAVASA Marketing Gallery and Show Units at a ribbon cutting ceremony today. 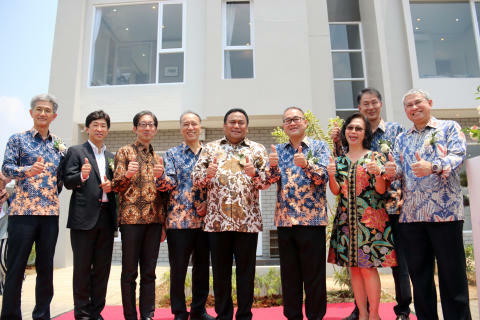 Panasonic Homes, a Japanese housing developer belongs to the Panasonic Group, is collaborating with Sinar Mas Land to develop the SAVASA residential project in Kota Deltamas, Cikarang, Bekasi Regency. Ownership of the project is split 49% to PDL which is a public-listed company under Sinar Mas Land, Sojitz Corporation and others, and 51% to Panasonic Group (Panasonic Homes). The two companies formed a joint venture company called PT. PanaHome Deltamas Indonesia (PHDI) in November last year, and it will develop a residential project covering a total planned area of 37 hectares. These two companies have poured in investment with the sum of Rp. 360 billion for land purchase and development in the first phase. SAVASA’s development will be divided into three (3) phases, with the first phase development within an area of 13 hectares and consists of 811 houses and 33 shophouses, distributed in 4 clusters: Asa, Niwa, Hana and Yuta. The design combines the elements of green environment, modern life, smart living features and earthquake-resistant building technology. SAVASA is here to provide the best home and living solutions for the people of Indonesia. With the tagline "Smart Lifestyle," SAVASA will develop a smart town in Kota Deltamas which based on four basic concepts: 1) Smart Township; 2) Smart Security; 3) Smart Home; 4) Smart Community. This residential neighborhood located strategically within a convenient distance from main business districts in Deltamas City, Bekasi Regency, Indonesia and it is just 5 minutes away from the Karawang Station of Jakarta-Bandung High Speed Rail and the future toll exit of Km.41.6. SAVASA comes with two types of house, namely Type A and B. Type A, with a land area of 66 m² and a building area of 64 m², consists of two bedrooms, while Type B, with a land area of 84 m² and a building area of 80 m², consists of three bedrooms. Both types are also equipped with a carport in each unit. This residential area also comes with public facilities such as public charging stations of mobile phones and laptops, Delivery Dropbox to maintain the security of the cluster during shipment of goods, and smart security features such as CCTV cameras, infrared beam sensors, and access card systems for the residents. Hongky Jeffry Nantung, President Director of PT. Puradelta Lestari Tbk (PDL) as well as Commercial CEO of Sinar Mas Landsaid, "Seeing the rapid development of Cikarang area and its surroundings lately, especially with the official appointment of Kota Deltamas as the location of Cikarang Japanese School, gave confidence to us the importance of providing quality housing with Japanese standards here. In order to achieve that, we are collaborating with Panasonic Homes, who has vast experiences in developing smart town such as the extremely successful Fujisawa SST in Japan, to jointly build 37 hectares of premium residential products on our land. Sinar Mas Land is always committed to continuously innovating, to provide the best housing selection at affordable prices for the people of Indonesia." Kazuhiko Tanaka, President Director of PT. PanaHome Deltamas Indonesia (PHDI), who also serves asPresident Director of PT. Panasonic Homes Gobel Indonesia, added "Panasonic Homes has 54 years of experience building more than 490,000 homes in Japan, and we have implemented our housing technology in Taiwan, Malaysia and now in Indonesia. We believe our unique Wall-Precast Concrete (W-PC) technology can help to provide solutions for the backlog of 13 million homes in Indonesia, since we can shorten the construction period by at least three months while maintaining a high-level of quality. Together with Sinar Mas Land, we aim to achieve sustainable urban development which shows consideration for environmental conservation and safety, providing a high-quality living cluster to Indonesian people." "Anticipating the community's need for quality but environmentally-friendly housing, together with Panasonic Homes, we plan to offer the SAVASA housing cluster with the initial price of Rp. 978,000,000 and NUP of Rp. 5,000,000,” said Hongky Jeffry Nantung, President Director of PT. Puradelta Lestari Tbk (PDL) and Commercial CEO of Sinar Mas Land. SAVASA is strategically located in the heart of Kota Deltamas, which is rapidly developing more and more facilities and infrastructure that supports the principles of life, work, and play. The area also has some of the best schools and colleges, such as Pangudi Luhur Bernardus School, Ananda Mitra Industri Deltamas Vocational School, ITSB’s campus (Sinar Mas's collaborative campus with ITB), a Korean education complex and Fajar Hidayah. Not only that, an AEON Mall will also be built in this area, as well as Mitra Keluarga hospital, elevated highway, new exit Gate of Km 41.6 and High-Speed Rail train TOD Development of Karawang station. Direct access to the Jakarta Cikampek toll road will be available from the existing Km.37 Exit Toll of Cikarang Pusat. Kota Deltamas is a modern integrated independent city, built on an area of approximately 3,177 hectares combining international-standard residential, commercial and industrial areas with a variety of world-class facilities and infrastructure. PT. Puradelta Lestari, Tbk (PDL) was listed in Indonesia Stock Exchange since 2015 and has developed Kota Deltamas for more than 20 years since its inception. With the collaboration of Sojitz, one of the leading conglomerate companies in Japan, PDL is committed to providing the best facilities and infrastructure for both Kota Deltamas and the GIIC (Greenland International Industrial Center) industrial area within it, covering an area of 1,458 hectares with more than 120 industrial tenants. The other advantages of Kota Deltamas are its very strategic location and easy access. The Jakarta-Cikampek Toll Road can be accessed directly from Exit Km 37 Cikarang Pusat, providing greater convenience to both residents and business operators in Kota Deltamas.